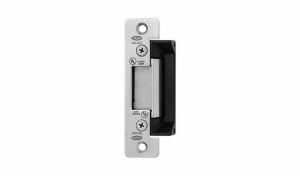 The high security Vortex Electro Magnetic Lock is smaller, lighter, has a stronger holding force and uses less than half the energy when compared to a conventional magnetic door lock. It also has door open / door forced monitor contacts and does not require additional magnetic contacts to monitor for door open. This makes for a neater, faster and more secure installation than the equivalent solution using a conventional maglock installation. The high security Vortex Magnetic Lock is smaller, lighter, has a stronger holding force and uses less than half the energy when compared to a conventional magnetic door lock. It also has door open / door forced monitor contacts and does not require additional magnetic contacts to monitor for door open. This makes for a neater, faster and more secure installation than the equivalent solution using a conventional maglock installation. Holding force of 8000 N.
Operates on 12/24v DC at max current of 250mA. Early warning sounder which, in conjunction with a pressure sensor and switched output allows an alarm to be raised before any security breach takes place. A high visibility LED is provided for door status. Includes a security anti-tamper bracket to protect the lock once the door is shut.